The original Physics building is now ironically the Badham building, re-named for one who thought the applied sciences bread and butter subjects best not introduced. This was the first purpose-built science laboratory in the University constructed in 1888 to specifications by the new Professor of Physics, [Sir] Richard Threlfall with many design features specific to its scientific function and touted as the best in the entire world outside Great Britain. Threlfall, an early and very influential Professor of Physics, deserves to be better remembered. He was short, with a powerful physique and vigorous personality, and could sway a crowd with his oratory. He was a formidable Rugby blue who claimed that ‘only an aversion from treading on a man’s face had prevented him from playing for England’; in Sydney he turned out with the university team. 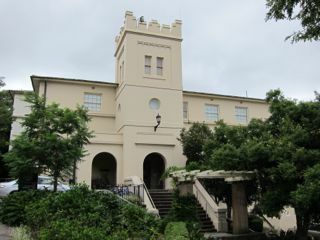 He loved shooting, fishing and the outdoors, belonged to the Union Club and was ‘one of the most sociable and “clubbable” of men’, a quality that stood him in good stead when it came to extracting from the New South Wales government the money he needed for his new laboratory. Threlfall advised the government on sewage disposal and chaired two royal commissions (1896-98) inquiring into the causes of spontaneous combustion of coal cargoes in ships. Threlfall had a passion for research and a determination to create in Sydney a major centre of physical inquiry. Immediately upon his arrival Threlfall launched an extensive series of projects using equipment he had bought, without authorisation, in Europe. He returned to a business position in England before the first world war. The original Physics Laboratory was a single storey rendered masonry building with a slate roof. The double hung windows, each set within a recessed panel, had multiple panes. The crenellated tower, to the west of the building formed the main entrance. It enabled the time ball at the Observatory to be seen. The features specific to laboratory needs included deep foundations to eliminate vibration, non-magnetic materials and exposed services for easy access. A separate battery room provided the laboratory’s own power supply. Strictly functional in style, the laboratory was located behind the main buildings ‘so as not to disfigure them’. Additions in 1900-1903 and 1918-1919 were constructed in similar style. The laboratory was located adjacent to what was then the west gate of the University, showing the extent of the University buildings at this period. In 1925 Wilkinson added a second storey and a new porch to fit his Mediterranean concept . At the same time, the building was vacated by Physics and taken over by Electrical Engineering so substantial internal modifications were also undertaken. It has subsequently been divided between various users including electrical engineering, organic chemistry, pharmacy and psychology. The 1940s additions are some of the few buildings of this period on the campus. 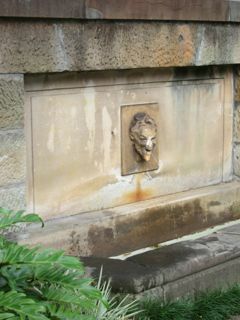 As you walk further up Science Road you will notice the Mephistopheles Fountain, also by Leslie Wilkinson, which was positioned in front of the Badham Building facing Science Road. It was one of a number of elements intended to enhance the Mediterranean effect and marks the point at which the West gate stood.